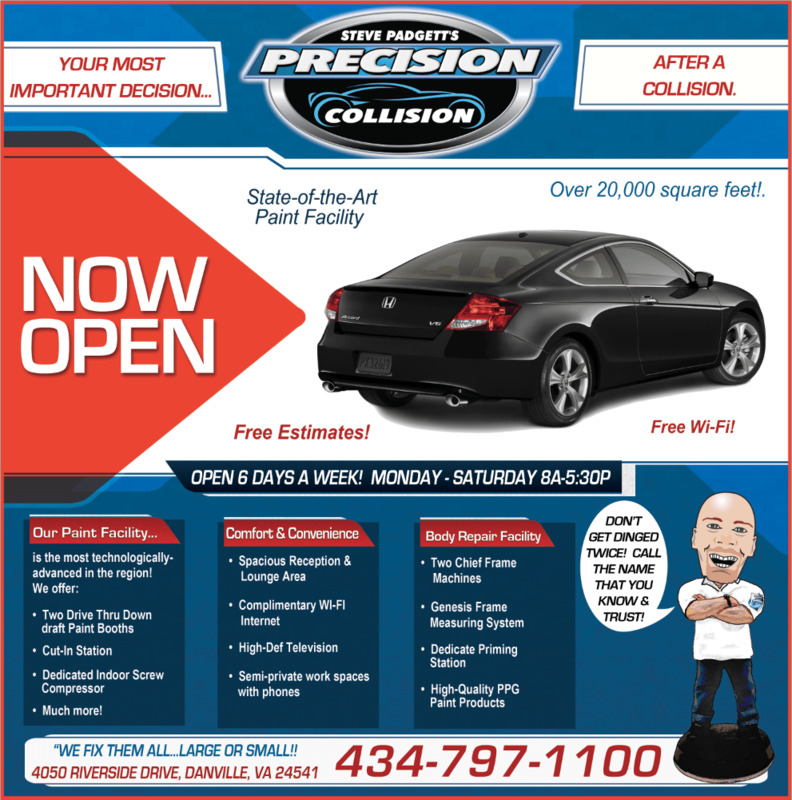 Steve Padgett's Precision Collison was opened in 2012 right next to our Honda store. Since our opening, we have repaired hundreds of vehicles from near and far in our state-of-the-art facility. Our highly skilled repair men bring OVER 100 YEARS of combined experience! Our expert estimators will work with your insurance company to provide you a thorough estimate of the damage to your vehicle We'll work hard to get you back on the road as quickly as possible! For your convenience, we offer Complimentary Shuttle Service and Early Morning/Late Night/Saturday Drop Off. While we would all love to live in an ideal world where automotive accidents never happen, it is a reality that we must be aware of, as our safety depends on it. Should the worst come to pass, from a slight bump to a more significant collision, you'll likely experience enhanced stress and anxiety as a result. Here at Steve Padgett's Danville Honda, we'll help remove some of the stress from the repair process with our talented team of service technicians and friendly pricing. Dealing with an occurrence such as a car accident, it is nice to have support from friends and family, but also from a body shop like our onsite repair center. Whether you're driving a new Honda or another vehicle, we're ready to fix it right and get you back on the road. Offering highly skilled staff members and state of the art equipment, we'll make the whole process a more convenient experience and get you back to enjoying the road in your vehicle. We proudly offer complimentary shuttle service as well as early and late drop off for even more convenience. On top of this, we feature a spacious reception and lounge area complete with complimentary Wi-Fi and semi-private work spaces should you choose to stick around while we get to working on your car. Drivers from Roanoke and Lynchburg will find unrivaled satisfaction with our service team. We offer free estimates, so call us at (877) 293-5660, or stop by 4050 Riverside Drive Danville, VA and we'll help you get started on the path to vehicular recovery. Come see us today and don't let something like an accident slow you down.